I was disappointed to find out that Francis Bacon’s record-breaking Three Studies of Lucian Freud has (apparently) been bought by the New York art dealer Acquavella. Just for a moment, I thought the anonymous purchaser might be Damien Hirst. Britain’s best-known contemporary artist has a bit of money. He is also a forthright fan of Bacon. 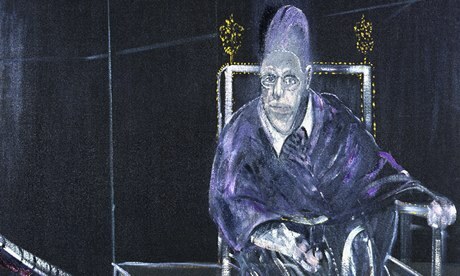 “I think Bacon is one of the greatest painters of all time”, he told the Observer in 2008. In fact, he has bought at least five paintings by Bacon. But the connection between Bacon and Hirst goes deeper than fandom or even ownership. He identifies with the visceral, meaty art of Bacon, even perhaps sees himself as Bacon’s double. Talking about his hero in that Observer interview, he contrasted what he claims is Bacon’s technical clumsiness as a painter with Lucian Freud’s precision. He apparently thinks that, like Bacon, he can get away with lack of virtuosity in his paintings through sheer imagination. This is a misunderstanding on Hirst’s part. Bacon was a gifted painter with a rich sensual mastery. Hirst’s own paintings are utterly talentless. Comparing him as a painter with Bacon is like comparing a hundred monkeys at the piano with Glenn Gould. But in his vitrines, his only significant contribution to modern art, Hirst apes Bacon effectively. The isolation of his shark in its glass and metal tank, with its mouth open wide, is a clever echo of Bacon’s series of paintings of a pope screaming in a glass booth. The nightmare natural history of Hirst’s A Thousand Years, in which flies are born, feast on flesh, and die, translates the desperate universe of Bacon’s paintings into three dimensions. And then it hit me. Why is Bacon suddenly the man of the hour? Because he fills a need. A need that Hirst cannot satisfy. There are some people who were never “taken in” by Hirst. They saw through him from the start. Clever them. But others among us love art, and want it to be fierce and necessary and impossible to ignore. That’s why we got excited about Hirst in the 1990s, when his striking images of nature, death and imprisonment said so much more than most of today’s art. Now that Hirst is so abjectly exhausted, the stupendous Bacon looms up in his vacated vitrine. I am a disillusioned fan of Hirst, a bereft former believer. And now, when I look at the art of Bacon, I feel an old passion stir. It is not too late to believe, after all. Bacon is my new art god, and for a simple reason. He is Damien Hirst – with talent.